Sabanci University Sakip Sabanci Museum (shortly Sabanci Museum) was opened early 2002 summer and since it is located at Emirgan the museum has the easiest access. If you are not going to drive you can take a bus from Beşiktaş en route to Sarıyer and take off at Çınaraltı stop after a short but joyous Bosphorus trip and when you cross the road you reach the entrance of the museum. Meanwhile the museum has a large parking lot. You can review the history of this site, known as Atlı Köşk (Equestrian Villa) among Istanbulites, given as the subtitle. You enter a stately and well-kept garden, get your ticket and begin to walk uphill by following the signs. Statues, sarcophaguses and embroidered stones are scattered on the roadside. There are also banks on this quite steep slope, which are ideal to sit for a while and enjoy the beautiful Bosphorus panorama. When you reach the top, the Kiosk, which is the museum building, and a section in which the bronze statutes of Sabancı family are exhibited meet you. The living and dining rooms once the Sabancı family used are located at the entrance of the museum. These rooms are preserved, as is with their original furniture and the family’s collection of 18th and 19th century China porcelains, polychrome vases, decorative plates, Ayvazovski and Zonaro’s paintings, Sévres vases and 19th century French and German china meet you. This floor also hosts a boutique at which silk scarves, neckties, t-shirts created for this museum by worldwide famous Turkish designer Atıl Kutoğlu who is inspired by Sabancı Calligraphy Collection, books, and CDs. Then you go upstairs and find several closed doors, however the signs will lead you the right room. Wait for a few seconds to adapt the dimness of the room and examine your surroundings. The silver divit (ink holder) collection consisting of samples of instruments used in writing such as pens, pen cases, pen knives, reed-nibblers and polishers displayed on the center of the first salon and the walls are full of the most exquisite examples of calligraphy art. The Ottoman calligraphy works have previously been on show at the famous international New York Metropolitan Museum and Paris Louvre Museum. After touring these three halls, which are leading one another, you are going to reach “Panorama Room”, take a deep breath and absorb the magnificent Bosphorus view. The other three halls on the same floor again host rare examples of calligraphy work such as hand written Korans and imperial decrees. Then you go downstairs and tour the “Memory Room” at which the memories and photos of Sakıp Sabancı as well as his plates are exhibited. After this tour “Winter Garden” meets you with its very pretty café. Passing from the winter garden you reach “The Gallery” which was built afterwards. This two-story building house the paintings of Turkish Artists owned by Sakıp Sabancı. Since painting and sculpture is not welcomed by Muslim beliefs, Turkish painting has begun to creep only in early 20th century. 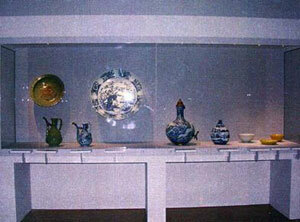 You can follow the improvements of Turkish paintings while admiring the works exhibited. However the goal of the museum is to host international exhibitions in coming days. After the museum tour you can either order an excellent breakfast at Sütiş or an ice cream at Çınaraltı Çay Bahçesi with special tastes; or drink a cup of famous Emirgan tea.